The Moon moves around an elliptical orbit, with the Earth as one of its foci. This means that the distance between the Earth and Moon is always changing. 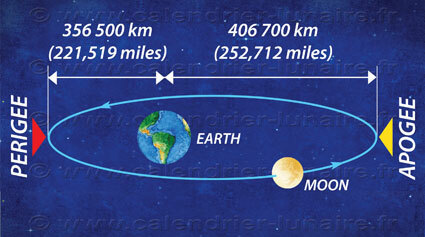 When the Moon is closest to the Earth, it is at its perigee, and when it is furthest away, it is at its apogee. The progress of the Moon from one perigee to the next is known as the anomalistic lunar cycle and takes 27 days, 13 hours and 18 minutes.